With the wedding less than 12 months away now, Thom and I wanted to go away without it breaking the bank as we are still saving every penny. I think sometimes you just need a night away, no cleaning or dishes where you can relax. I had a desire for a city break that we could do a bit of sightseeing as I absolutely love looking into the history of a city. I decided on Lincoln as I actually went to uni and lived there for 4 years. I have been living back in Newcastle for nearly 9 years now and haven't been to Lincoln in 6 years. I am always harping on about what a nice city it is and I really wanted to go back as a tourist and experience the amazing things I used to just walk past every day and not give a second thought to. I had a look on Booking.com for a nice hotel. I wanted to stay at the top of the city near the cathedral and castle and that's when I saw a brand new hotel that was not there when I lived in Lincoln. The Rest is a small hotel with only a few bedrooms and is situated half way up Steep Hill. Steep Hill is an extremely literal description of the path that leads from the city centre up to the Cathedral/Castle area, it is so steep you are pushing against yourself walking up it and usually have to stop for a breath half way up, this is no exaggeration. I don't think Thom actually believed when I kept telling him how steep Steep Hill actually is until he had to walk it himself (his calves are still hurting!). That being said it is a short walk and I was being overtaken by elderly ladies. I can't believe I used to walk up it every day when I lived there. So getting back to the hotel, the pictures online looked beautiful and it had only opened in December last year so was still fairly new, I think I remember it being an old book shop before that maybe. When we arrived we left the car at a short stay car park and walked up (steep hill) to the hotel. It was easy to find, but I did already have knowledge of the area. We were shown to our room by a very friendly, lovely young lady that advised of all the info we needed and how to work keys/doors and when breakfast was. She was more than happy to give advice on where to go and where we should park the car. You can purchase a 24-hour parking pass from them for £5 which is really useful as city centre parking is expensive. We dropped off our bags and did the usual snooping around the room, which was stunning. We had a garden room with a big 4 poster bed a good sized bathroom, a fridge, tea/coffee making and all the essentials and more that we needed. Actually finding the car park to leave the car was a little more tricky but this might have had something to do with me leaving the car park map in the room, oops. Thom was not best pleased as Lincoln is a little tricky to drive around with its one-way street and no access roads. In my defence, I never had a car when I lived there so didn't know how to get around that way. We eventually found the castle car park which was only a 5-minute walk back to the hotel. And then the sightseeing began. All the shops leading up Steep Hill and into the Bailgate area are all one-off little shops, tea rooms, restaurants and bookshops, I love this as it feels like you can discover some amazing one-off pieces or handmade items. Walking into the centre you start seeing more of the well-known names but Lincoln still keeps its old town charm. There is a waterfront called the Brayford Pool where a lot of the big restaurant are and some beautiful boats, it's stunning here when it is sunny but as it was starting to rain we headed back up the hill to the Cathedral. I was extremely humbled by the cathedral, reading about its history and just taking in the architecture was amazing. I am not a religious person, but I think you can still appreciate how fantastic Lincoln cathedral is. We were lucky enough to be walking around when the choir was practising, and wow what an amazing sound. Choosing somewhere to eat was difficult, I am on an eating plan so could go anywhere that served chicken salad. 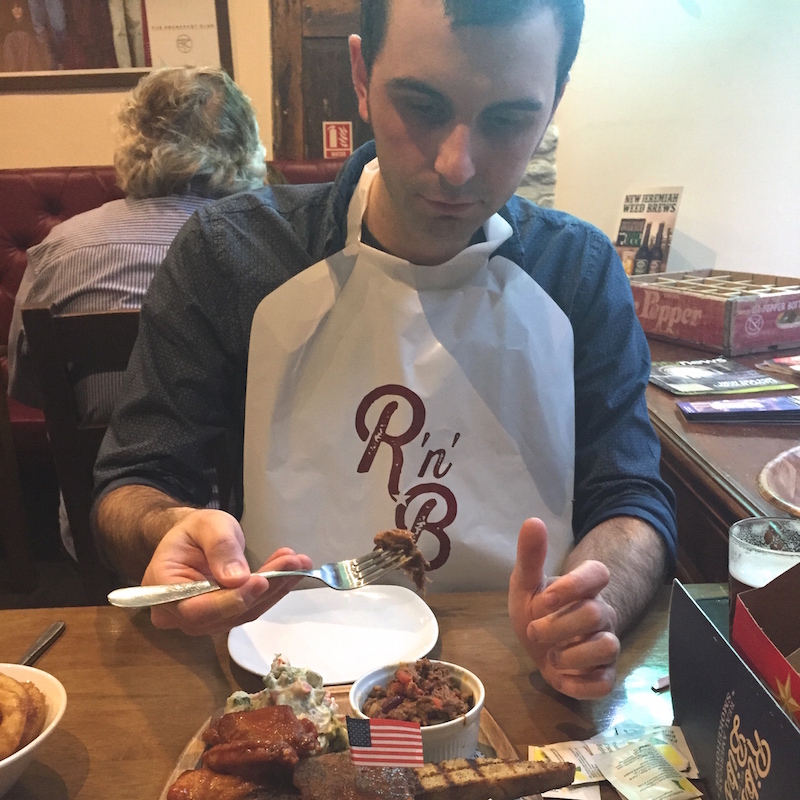 Stupidly I decided on a restaurant called Ribs & Bibs, probably the most amazing BBQ ribs place ever. The food was incredible, I had a little bit of meat and Thom ate pretty much a whole cow. The next day we got up early for the complimentary breakfast. It was in the tea room at the front of the hotel. All the usuals were available from fruit, cereal, yogurt, pastries to the full menu of cooked breakfasts. Thom had the full English (he also took this blurry picture, I apologise) It looked amazing and he said was really nice. And then we went back to the room and chilled out a bit until check out. The plan for the rest of the day was to explore the castle. There is so much history in Lincoln its amazing to see. There is a Victorian prison inside the castle and also this is where the Magna Carta is kept. I 100% recommend The Rest, the location is amazing and it has everything you need in a hotel. The staff were friendly and the food was great. Lincoln is easy to get to by car from Newcastle it just takes about 3 hours.